In 2000, the OPDA was formed and began work on its first project, the Odessa Industrial Park. With financial support from the Town of Odessa and a landowner with a vision to see Odessa grow, the OPDA was able to purchase acreage north of town. In the spring of 2001, the OPDA applied for and received a $500,000 loan and $500,000 grant from CERB (Washington State Department of Commerce’s Community Economic Revitalization Board), the first building was built and North Basin Seed Company began cleaning grass seed. In the fall of 2002, two more businesses constructed facilities and began operating through CERB loans and grants. With three successful projects completed, the OPDA was ready to take on another project: a biodiesel crushing and refining facility. This project was a public/private partnership that reached beyond Odessa. 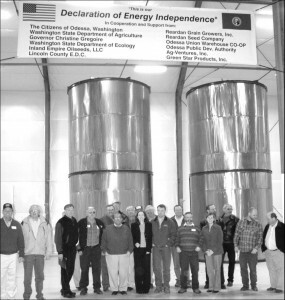 Local businessmen and farming co-operatives in Eastern Washington pooled their resources together to create Inland Empire Oilseeds. In 2006, the OPDA received a loan from the WSDA as part of the Bio-Energy Act to construct, develop and operate a renewable energy project. In the fall of 2008, bio diesel was produced from that plant. After receiving funding in late 2006, the OPDA began the construction of a large scale biodiesel processing plant. Phase 1 involved construction of the refining portion of the plant. The refining plant began operations in the spring of 2009 and the first 33,000 gallons of biodiesel were sold to a distributor in Portland. This project not only brought about new jobs to Odessa, but also brought money into the community. Local contractors were utilized as much as possible; purchases were made at the local hardware store, grocery store, hotel and restaurants. In 2009, the OPDA partnered with Barr-Tech to create the Barr Bio Industrial Park near Fishtrap. The composting facility is up and running and accepting all types of organic waste. The OPDA has created a blueprint for other rural communities to follow. The infusion of money and jobs to the area has brought about economic growth and stability to sometimes volatile agricultural based economy. The OPDA realizes the importance of partnering with sound financial businesses that bring jobs, revenue and families. One new business to a community can have a ripple effect throughout the community. If that business hires just one employee that chooses to relocate to Odessa from outside of the community, it may bring more students to the school system, more patients to the hospital, additional taxes for governments and spending in the local businesses.